On Sale Now! Free Shipping Included! 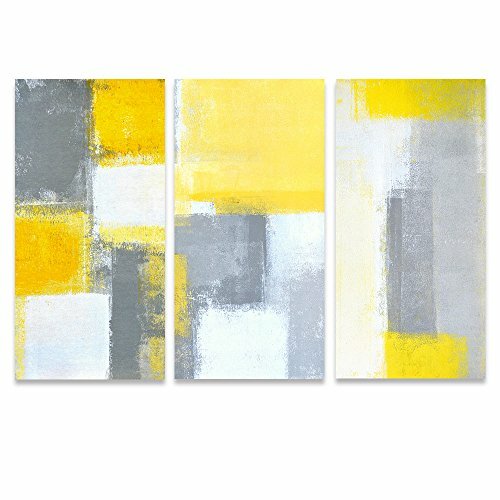 Save 10% on the SUMGAR Abstract Wall Art Yellow and Grey Paintings on Canvas Wall Decor for Living Room Large 3 Panel,16x32x3p by SUMGAR at When Art Imitates Life. MPN: 0117117101. Hurry! Limited time offer. Offer valid only while supplies last. ABOUT SUMGAR WALL ART: Since 2006, Sumgar wall art has been obsessed with one thing: providing customers with premium quality wall art anywhere. Since 2006, Sumgar wall art has been obsessed with one thing: providing customers with premium quality wall art anywhere. Sumgar has its own factory. According to the designs of its team, it makes products in different styles, including oil paintings on canvas, acrylic paintings, Mixed-media paintings, Watercolor paintings. In order to fulfill the requirements of different customers, it designs products of different styles, such as modern art, contemporary art, abstract art, famous art and pop art. The back of the wooden frame is both nailed and sealed with white masking tape. Stretching canvas on a frame is an age-old practice that requires skill and knowledge. Sumgar's team of experts hand-stretch each canvas to perfection and ensure the corners are perfectly folded and tucked. If you want more choices, please search "sumgar wall art". We hope you're pleased with your SUMGAR Art purchase. If you can't put the obvious holes on the wall, hang them with the command hooks or push pins or nails. DOUBLE STRENGTHENING TECHNOLOGY: the back is both nailed and sealed with white masking tape. STRETCHED BY HAND:Hand-stretch each canvas to perfection and ensure the corners are perfectly folded and tucked. STURDY CANVAS FRAME:1.2'' thick wood bars and it is not easy to deformation. EASY TO HANG UP:Each panel has a metal hook already mounted on the wooden bar. FREE ACCESSORY:Screws included.If you can't put the obvious holes on the wall, hang them with the push pins or nails. If you have any questions about this product by SUMGAR, contact us by completing and submitting the form below. If you are looking for a specif part number, please include it with your message. Three 8x10 Prints, Blue Watercolor Abstract Prints, By Paper Riot Co.